Inspired adventure that transcends being an AP-plugin! Highly recommended dark fantasy yarn! This adventure clocks in at 57 pages, 1 page front cover, 1 page inside of front cover, 1 page editorial, 2 pages of introduction, 1 page ToC, 1 1/3 pages of SRD, 2 pages of advertisement, 1 page back cover, leaving us with 46 2/3 pages of content – all of which sport a surprising amount of material, as Legendary Games books have a pretty high word-per-page-density. Okay, first things first: This adventure is intended for characters of 10th level and can thus fit pretty easily behind the 3rd adventure in the Curse of the Crimson Throne module, and before the 5th – the module provides a thematic continuation of the leitmotifs of colonial corruption that the first 3 modules sported, which are curiously absent from the otherwise intriguing and evocative 4th adventure. As such, theme-wise, this indeed enhances the AP. It should also be noted that this supplement includes a new corruption, making use of Horror Adventures’ rules. However, you do not necessarily need to have the Horror Adventure supplement to use this adventure. Really cool: There are two new, properly codified occult rituals that feature in the plot of the adventure, both of which employ the themes and leitmotifs established in the adventure path. As always for supplements in the series, we have an adventure that seamlessly integrate with the AP, employing filed off serial numbers that still allow you to easily note what is going on. A huge plus would btw. be that the amazing full-color maps do come with player-friendly versions for your convenience. Big comfort-plus here! Inexperienced GMs will enjoy the fact that we have extensive read-aloud texts accompanying the module. All right, as always, the following discussion contains SPOILERS. Potential players should jump ahead to the conclusion. All right, only GMs around? Great! So, the chaos in Korvosa has generated opportunity: The Shoanti (Sklar-Quah), have attacked a remote fort: Fort Hiraksos. When the PCs venture towards the fort, they find a massacre – the battlefield is littered with fallen Shoanti and members of the erstwhile garrison. All of the corpses show a specific pattern: Gaping chest-wounds. As the PCs explore the remnants of the fortress, they will have to contend with lethal undead, ranging from wights to callers in darkness and juvenile rukhs; there are deadly corpse flies and Hiraksos itself is a rather grim – the exploration of the grim keep is fantastic – even beyond the confines of the AP, the depiction of a haunted place of a true massacre is intriguing and flavorful, in both diverse enemy selection: We get unique haunts that add to the sense of decrepitude and metaphysical corruption – and the them of blood/flesh engendering fear is reinforced via, for example, ectoplasmic hungry flesh or a particularly nasty, unique wight. You see, Austan Mileswood, decorated Korvosan hero, driven insane, is working on a ritual to transcend his form, as an invisible timer is ticking away in the background, and dawdling may see him improve his darkened powers – and we btw. get a CR 10 and CR 11 statblock for this big boss as well as an extensive and well-written background story for this rather tragically flawed individual, who exemplifies so well that one people’s hero may be another people’s villain. Anyways, he has learned from the darksome shoanti spirits – that there lies strength in the hearts of the living, stealing the courage, metaphysically seated in the heart, from his victims. An addiction had formed, and what the PCs now witness, is the sad culmination of, what could be considered to be a fantastic take on a form of PTSD. Thus, in order to truly “win” in this adventure, the PCs will have to venture down into the ancient Well of Bloody Hearts, sanctified to the wicked cannibal spirits of old, where mummified clerics and warriors loom…but beyond these, brimstone oozes and a unique creature dubbed “The Tongue” await – the latter btw. is a unique aberration with a twisted artwork, and a cool, superbly depicted athach is here as well – and stopping Austan’s ritual is NO trifle. With aether elementals and his own, significant combat prowess, the charismatic “hero” makes for a formidable foe – and yes, he is multiclass’d and has a cool mechanical angle. Here, I should definitely mention that the timeline noted before is not just cosmetic: throughout the adventure, the time elapsed always matters. Kudos for being consequent! Editing and formatting are top-notch, I noticed no serious guffaws on either a formal or rules-language level. Layout adheres to the “Curse of the Crimson Throne”-plugins series’ elegant 2-column full-color standard. Huge plus: We get quite a lot fantastic full-color artworks that I haven’t seen before, and the cartography is similarly impressive and full-color. As noted before, getting player-friendly maps is a big plus. The pdf comes fully bookmarked for your convenience. Tom Phillips does horror and dark fantasy really well; if you’ve been following his works, this will be no surprise to you. He is one of the authors whose adventures tend to offer meaningful challenges for the PCs, while still retaining a dense and evocative atmosphere. “Hero’s Blood” exemplifies these virtues. The adventure manages a feat that is impressive indeed: On one hand, it actually manages to carry a leitmotif that isn’t present in the otherwise fun “A History of Ashes” and thus strengthen the overall plot of Curse of the Crimson Throne – the emphasis on Korvosa affecting these lands adds to the plot. 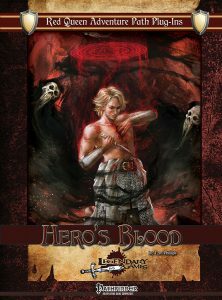 In addition to that, though, this adventure manages to transcend the status as an adventure path plug-in: Its plot and ideas are sufficiently distinct to carry the adventure as a stand-alone supplement – if you like horror or dark fantasy, particularly themes that feature blood/vampiric elements in a cultural context that is a breath of fresh air, then consider this to be a success and well worth getting beyond the confines of the AP. So yeah, regardless of within or without the associated AP, this is a success, no matter how you look at it. 5 stars + seal of approval – excellent job! You can get this inspired dark fantasy yarn here on OBS!